The scene is a familiar one. You’ve just finished your super-sized lunch at the local mall’s food court, the early stages of a food coma setting in, when all of a sudden you’re confronted by an overwhelming array of waste receptacles as you attempt to empty your food tray. Food waste. Paper waste. Glass waste. Aluminum Waste. Waste waste. You stare blankly at the wall of options and find yourself completely discombobulated by the amount of disposal choices you have. And you’re not alone. Even though recycling is so common and accessible (92% of Canadians had access to recycling in 2007) many people are often confused as to what cannot be recycled and whether an item should be composted, recycled, or trashed. There was a time when mullets were on trend and in style. There was also a time when glossy paper wasn’t recyclable. Thankfully, the time of non-recyclable glossy magazines is gone, and along with it the era of the mullet. Toronto waste audits in 2012 & 2013 found that 15 percent of the contents of homeowners’ curbside garbage bins was recyclable. And a look at recycling numbers in 2015 was even more disconcerting as the city of Toronto found an estimated 45,000 tonnes of garbage mistakenly put into recycling. This garbage can damage equipment, cause injuries at recycling facilities and can ruin other recyclables. Toronto’s recently launched campaign, Bad Things Happen, was born from the need to educate the public about proper recycling procedures. If you had tested us on what items can be recycled before we went through the information in the Bad Things Happen campaign, we would have been pretty confident with our answers. Sadly some of the answers would have been wrong. Coffee cups, for instance, are something we’ve been recycling, but should actually fall into the “what cannot be recycled” category. Realizing we’re probably not alone in our assumptions, we decided to share some of the mistakes we ourselves were making, and did some digging to find out more. Take a walk down the street on any given garbage day and you’ll see coffee cups or fast-food soft drink cups in the blue bins of nearly every house on the street. They don’t belong there! The plastic lining that prevents them from leaking also makes them unsuitable for recycling. You can recycle the lids if they’re not black, as well as the cardboard sleeve for hot beverage cups, but unfortunately the cups themselves belong in the garbage. Seems like just yesterday when plastic bags were free at the grocery store and a reusable bag was something you called your purse. Back then, plastic bags were not allowed in the blue bin at all. The only way to recycle them was to return them to the rare grocery store that had a recycling receptacle for them. Nowadays, plastic bag recycling is sort of a mixed bag (couldn’t resist the pun). It varies by municipality, so check with yours to find out the guidelines in your area. The lucky residents of Toronto can now put them in their blue bin, while residents of Markham have to take them to a drop-off depot. The unlucky residents of York region are left holding the bag (last one, we promise), because York region doesn’t accept them at all. Residents are advised instead to return them to retailers participating in the Plastic Bag Take-Back program. Regardless of where you live though, the simplest solution to the problem of plastic bag waste is to eliminate it altogether. Use reusable bags when you shop. They generate zero waste, carry more and are more durable than plastic bags anyway. Paperboard and cardboard containers or packaging that’s been soiled with food should be thrown in the green bin rather than the blue bin. This includes greasy cardboard pizza boxes and saucy paperboard Chinese takeout containers. It also includes dirty napkins and paper plates. The clean top of a pizza box, however, can be torn off and recycled. Contaminated paper products in your blue bin can affect other recyclables and degrade the quality of any end products made from these materials. Preventing this contamination is also why it’s important to clean other items such as plastic, glass and aluminum before throwing them in your blue bin with paper products. While your empty spaghetti sauce jar belongs in the blue bin, don’t assume that your broken Pyrex container does. Not all glass is accepted in your blue bin. Translucent bottles and jars are usually fine, but ceramic dishes, mirrors, Pyrex, light bulbs and window glass cannot be recycled curbside. Not only is the chemical composition of these items different, but they also have different melting points than container glass. This can cause problems at the recycling center during the recycling process. The thin paperboard boxes that many frozen foods come packaged in usually have a coating on them, like coffee cups, except in this case they prevent freezer burn. Because this coating is plastic, they aren’t suitable for either the green or blue bins. They belong in the garbage with the coffee cups. Because it’s paper and it’s clean, you’d think that shredded paper belongs in the blue bin. But you’d be wrong: at least in certain cities. Once again, Toronto’s amazing recycling program accepts shredded paper, in bags, in your blue bin. Shredded paper recycling in other cities is either non-existent or require that you take it to a drop-off depot. There was a time when mullets were on trend and in style. There was also a time when glossy paper wasn’t recyclable. Thankfully, the time of non-recyclable glossy magazines is gone, and along with it the era of the mullet. All recycling facilities that accept paper can accept magazines, so make sure you’re throwing them in your blue bin. And as you dispose of all your old magazines, try searching for a digital version of your favourite print content so you can eliminate magazine waste altogether. Styrofoam belongs in the garbage right? The short answer is “it depends.” It depends on where you live and on what kind of Styrofoam. Surprisingly, Markham accepts clean Styrofoam takeout containers and meat trays at their drop-off depots. Toronto, not so surprisingly, accepts them in their blue bins. And while York region residents can’t recycle Styrofoam takeout containers, they can recycle the protective Styrofoam packing normally used for electronics and appliances at one of their drop-off depots. Even in the amazing city of Toronto, you can’t throw all your recyclables into the blue bin. Battery recycling, for example, is pretty common now in Toronto and the GTA. Batteries, however, are considered hazardous waste by most municipalities and need to be taken to an Orange Drop or Call2Recycle location for recycling. We consider them hazardous waste as well and don’t accept them in our bins either. Again, make sure you check with your local municipality before you throw an item into your blue bin, or worse, before you throw a recyclable or hazardous item into the garbage. Do you really have so much time that you’re free to spend it crushing cans, plastic bottles and removing paper labels from glass jars? If so, by all means, have at it. If not, then just throw your clean cans, bottles and jars into the blue bin and be done with it. The tasks of crushing and label removal are handled by recycling machines. Save your precious time for other things, like reading this blog, for instance. 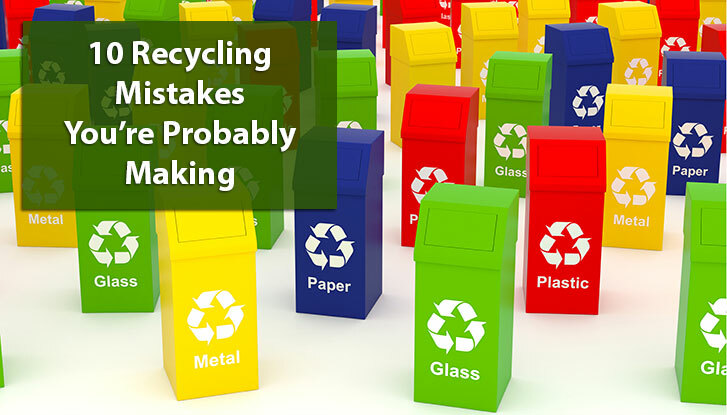 It’s important to note that policies and guidelines for recycling varies from location to location and also from time to time. As technology advances, the number of materials that can be recycled will inevitably increase so be sure to check with your local recycling programs to find out the most up to date guidelines for your area. Remember, stop wasting your time removing labels from glass jars! Use it instead to follow us on Facebook or Twitter for more tips, news and updates. City Waste Services is a garbage bin rental and junk removal company with over 20 years experience. After all this time, we've learned that every project is different, and every one of you is different. We'll make sure we satisfy all your dumpster rental needs so you can spend your valuable time on the rest of your project. What's more, we'll even make sure you get the best value on your waste bin rental as possible. *Our lowest price guarantee: If you find a lower price on bin rentals in Toronto or the GTA, show us the advertisement and we'll beat the competitor's price by 10%! Promotion for $25 off online bookings cannot be combined with any other promotional offers. Copyright © 2019 City Waste Services. All rights reserved.